Another Vietnamese-inspired dish that is being written about completely out of season. But just think what you can do with it next year when the veggies are fresh and you want something light but packed with flavor! Quinoa, by the way, is one of my favorite grains - it cooks very easily and is apparently incredibly healthy for you, but most importantly, I love the texture and taste it adds - a sort of nutty, lightly popping / crunching sensation between the teeth. Again, any in-season veggies that you would have in a salad would work below, so just use it as a guideline - the most important components not to forget are the dressing and quinoa. The vegetables and proteins can all be swapped out for alternatives. In the meantime, make the dressing by combining the lime juice, Asian fish sauce, sugar and crushed red pepper flakes in a medium bowl. Whisk until the sugar is dissolved. Add shrimp to the dressing and let marinate until ready to assemble the salad. 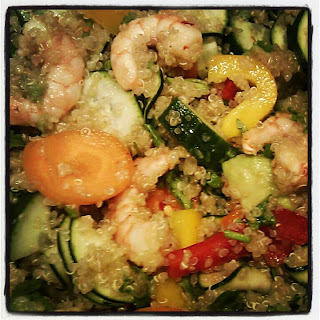 Once quinoa is cool, add red bell pepper, carrot, courgette, avocado, and cucumber to the bowl. Right before serving, add the dressing, shrimp and coriander and toss well. Taste and adjust seasoning with more salt, sugar or crushed red pepper flakes if necessary. Serve cold.